Whether you're selecting the finishing touches for a new home, remodeling an existing bathroom or simply giving one a facelift, the countertop is a key element that influences both appearance and functionality. Before you choose a material, consider the amount of use the bathroom receives. You could select an opulent marble countertop that gives the space a luxurious feel for a powder room that's not frequently used. While bathroom countertops don't have to endure as much wear and tear as those in a kitchen, durability should be a key factor in your decision. Don't forget to factor in ease of care and how well the material stands up to various cleaning products. Unless you're planning a complete bathroom makeover, you'll need to integrate the color and appearance of a new countertop with existing style elements. 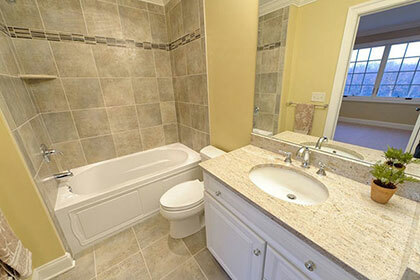 Be sure to consider the existing flooring, vanity, fixtures and wall treatments to achieve a cohesive style. Today's range of luxurious bathroom countertop materials gives you the opportunity to create a sumptuous space that perfectly matches your personal style and taste. You can remake your master bath into a posh spa retreat with the use of granite or marble, or create an indulgent ambiance in a guest bathroom with a quartz countertop. Before making a choice, measure the square footage you'll need and compare the costs of various countertop materials. Once you've narrowed down your options based on functionality and cost, you should obtain firm estimates that include materials, fabrication and installation before making a final decision.